As the use of educational technology becomes more ubiquitous, an enormous amount of learning process data is being produced. Educational data mining seeks to analyze and model these data, with the ultimate goal of improving learning outcomes. 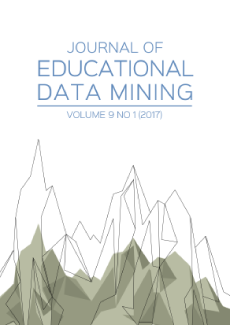 The most firmly grounded and rigorous evaluation of an educational data mining discovery is whether it yields better student learning when applied. Such an evaluation has been referred to as "closing the loop", as it completes cycle of system design, deployment, data analysis, and discovery leading back to design. Here, we present an instance of “closing the loop” on an automated cognitive modeling improvement discovered by Learning Factors Analysis (Cen, Koedinger, & Junker, 2006). We discuss our findings from a process in which we interpret the automated improvements yielded by the best-fitting cognitive model, validate the interpretation on novel data, use it to make changes to classroom-deployed educational technology, and show that the changes lead to significant learning gains relative to a control condition. ALEVEN, V., SEWALL, J., MCLAREN, B.M., & KOEDINGER, K.R. 2006. Rapid authoring of intelligent tutors for real-world and experimental use. In Proceedings of the 6th ICALT. IEEE, Los Alamitos, CA, pp. 847-851. BAKER, R. S., CORBETT, A. T., & KOEDINGER, K. R. 2004. Detecting Student Misuse of Intelligent Tutoring Systems. In Proceedings of the 7th International Conference on Intelligent Tutoring Systems, 531-540. BAKER, R. S., CORBETT, A. T., KOEDINGER, K. R., EVENSON, S. E., ROLL, I., WAGNER, A. Z., NAIM, M., RASPAT, J., BAKER, D. J., & BECK, J. 2006. Adapting to When Students Game an Intelligent Tutoring System. In Proc Int Conf on Intelligent Tutoring Systems, 392-401. Jhongli, Taiwan. BARNES, T. 2005. The Q-matrix method: Mining student response data for knowledge. In Proceedings of AAAI 2005: Educational Data Mining Workshop, 978–980. CEN, H., KOEDINGER, K. R., & JUNKER, B. 2006. Learning Factors Analysis: A general method for cognitive model evaluation and improvement. In Proceedings of the 8th International Conference on Intelligent Tutoring Systems, 164-175. Berlin: Springer-Verlag. CLARK, R. E., FELDON, D., VAN MERRIËNBOER, J., YATES, K., & EARLY, S. 2008. Cognitive task analysis. In Spector, J. M., Merrill, M.D., van Merriënboer, J., & Driscoll, M.P. (Eds. ), Handbook of research on educational communications and technology (3rd ed.). Mahwah: Lawrence Erlbaum. CORBETT, A. T. & ANDERSON, J. R. 1995. Knowledge tracing: Modeling the acquisition of procedural knowledge. User Modeling & User-Adapted Interaction, 4, 253-278. D’MELLO, S., BLANCHARD, N., BAKER, R. OCUMPAUGH, J., & BRAWNER, K. 2014. I feel your pain: a selective review of affect sensitive instructional strategies. In Sottilare R, Graesser A, Hu X, & Goldberg B (Eds. ), Design Recommendations for Adaptive Intelligent Tutoring Systems: Adaptive Instructional Strategies (Volume 2). Orlando, FL: US Army Research Laboratory. FENG, M., HEFFERNAN, N. T., & KOEDINGER, K. R. 2009. Addressing the assessment challenge in an online system that tutors as it assesses. User Modeling and User-Adapted Interaction: The Journal of Personalization Research (UMUAI), 19(3), 243-266. GONZALEZ-BRENES, J. P. & MOSTOW, J. 2012. Dynamic Cognitive Tracing: Towards Unified Discovery of Student and Cognitive Models. In Proceedings of the 5th International Conference on Educational Data Mining. Chania, Greece. KOEDINGER, K. R., BAKER, R. S. J. D., CUNNINGHAM, K., SKOGSHOLM, A., LEBER, B., & STAMPER, J. C. 2010. A Data Repository for the EDM community: The PSLC DataShop. In Romero C, Ventura S, Pechenizkiy M, Baker RSJd (Eds. ), Handbook of Educational Data Mining. Boca Raton, FL: CRC Press. KOEDINGER, K. R. & MCLAUGHLIN, E. A. 2010. Seeing language learning inside the math: Cognitive analysis yields transfer. In Proceedings of the 32nd Annual Conference of the Cognitive Science Society, 471–476. Austin, TX. KOEDINGER, K. R., MCLAUGHLIN, E. A, & STAMPER, J. C. 2012. Automated cognitive model improvement. In Proceedings of the 5th International Conference on Educational Data Mining, 17-24. Chania, Greece. KOEDINGER, K. R., STAMPER, J. C., MCLAUGHLIN, E. A., & NIXON, T. 2013. Using data-driven discovery of better cognitive models to improve student learning. In Proceedings of the 16th International Conference on Artificial Intelligence in Education. LAN, A. S., STUDER, C., WATERS, A. E., BARANIUK, R. G. 2013. Tag Aware Ordinal Sparse Factor Analysis for Learning and Content Analytics. In Proceedings of the 6th International Conference on Educational Data Mining. LAN, A. S., STUDER, C., WATERS, A. E., BARANIUK, R. G. 2014. Sparse Factor Analysis for Learning and Content Analytics. Journal of Machine Learning Research, 15, 1959-2008. LINDSEY, R. V., KHAJAH, M., & MOZER, M. C. 2014. Automatic discovery of cognitive skills to improve the prediction of student learning. In Advances in Neural Information Processing Systems, 27, pp. 1386-1394. La Jolla, CA. LIU, R., KOEDINGER, K. R., & MCLAUGHLIN, E. A. 2014. Interpreting Model Discovery and Testing Generalization to a New Dataset. In Proceedings of the 7th International Conference on Educational Data Mining. London, UK. NATHAN, M. J, KOEDINGER, K. R., & ALIBALI, M. W. 2001. Expert blind spot: when content knowledge eclipses pedagogical content knowledge. In Proceedings of the 3rd International Conference on Cognitive Science, pp. 644-648. Beijing, China:USTC Press. RITTER, S., ANDERSON, J. R., KOEDINGER, K. R. & CORBETT, A. 2007. Cognitive Tutor: Applied research in mathematics education. Psychonomic bulletin & review, 14(2), 249-255. SAN PEDRO, M., BAKER, R. S., ROWERS, A. J., & HEFFERNAN, N. T. 2013. Predicting college enrollment from student interaction with an intelligent tutoring system in middle school. In Proceedings of the 6th International Conference on Educational Data Mining. Memphis, TN, pp. 177–184. STAMPER, J. & KOEDINGER, K. R. 2011. Human-machine student model discovery and improvement using data. (2011). In Proceedings of the 15th International Conference on Artificial Intelligence in Education, 353–360. Auckland, New Zealand.